Disclosure: I was sent this book for review as part of a Blog Tour. As always, my reviews are fair and unbiased. 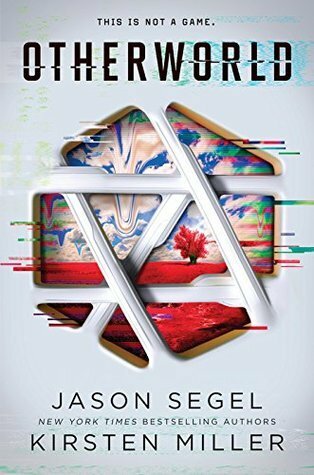 For fans of Black Mirror and HBO's Westworld, and readers of James Dashner and Veronica Roth, Otherworld is the first book in New York Times bestselling authors Jason Segel and Kirsten Miller's new YA sci-fi-thriller series. The future is now. And the future is terrifying. There are no screens. There are no controls. You don't just see and hear it--you taste, smell, and touch it too. In this new reality, there are no laws to break or rules to obey. You can live your best life. Indulge every desire. It's a game so addictive you'll never want it to end. Until you realize that you're the one being played. Where our backyard ends, the woods begin. When I was a kid, the wilderness seemed endless; now most of it’s gone. I look for the path that leads through what’s left of the forest. The trail’s grown over, but I could still walk it in my sleep. It leads straight to one of the few old houses around here that was never torn down. The land it sits on is swampy, and until recently the building had been slowly sinking for ninety-odd years. That’s where Kat lives. I’d be there right now if she’d just let me talk to her. But these days my best friend bolts whenever I get near her. It cost me a few grand and a near-death experience with my father, but I got to see her in Otherworld. Unfortunately, in Brockenhurst she wants nothing to do with me. Kat and I met ten years ago, when we were eight years old. My father had just made senior partner at his law firm, and he’d built this McMansion as his trophy. Thousands of trees were sacrificed to ravenous wood chippers, and our house rose near the edge of what would become the town’s swankiest gated community. We moved in on the first day of summer. Mrs. Kozmatka, the nanny my mother had hired, told me to stay on the grass in the backyard when I played outside. I wasn’t allowed to set foot in the woods, which my mother believed to be teeming with snakes, ticks and poison ivy. In her defense, Mrs. Kozmatka was new. She knew nothing of my history. And for the first couple of hours, I gave her no cause for concern. I sat exactly where I am right now and stared at the trees. Everything seemed so much more alive in the forest. As I was watching, I heard branches snapping and leaves rustling. And then someone stepped out from the other side. I’d been playing a lot of Harry Potter games that summer, and I was convinced it was some kind of mythical creature. It was pretty clear that it wasn’t a centaur, but I figured it could be a faun or a sprite. Even if the creature had spoken to me on that first encounter, I wouldn’t have believed she was human. I’d never seen another kid so dirty. She was covered in dried mud from head to toe. It was camouflage, Kat later informed me. And it worked like a charm. That day, when the nanny came outside, Kat took a step backward and vanished so completely into the woods that it was almost as if she’d been swallowed whole. In hindsight, it all seems perfectly clear to me. I’d been kept in a cage my entire life. I wasn’t a kid. I was veal. And then this portal opened up in suburban New Jersey and I was offered a glimpse of an untamed universe. I didn’t tell the nanny about the creature I’d seen. Instead I spent the next few hours eagerly waiting for it to return. I was sure it was spying on me, but it didn’t set foot on my grass again. And by lunchtime I just couldn’t wait any longer. When the nanny went inside to make tuna sandwiches, I slipped into the woods to go find it. Review I am a huge fan. I can say that now, after Otherworld landed on my doorstep and I darted to start it. From the get-go, it's seriously unputdownable and I was immersed by the world in an instant. It's truly modern meets futuristic, reeling in my attention. Simon is our main character. He's got a striking point of view from the start, telling us the story of his beginning and of Otherworld. His Parents are wealthy, so when he sees that a new Virtual Reality game has been created called Otherworld, he darts at the chance to get it, even if it isn't exactly gifted to him. Suddenly he's been chosen to test it as a Beta gamer for Otherworld. Inside the game, people can live their best lives and get to do whatever they would love out of life. But that's not the reason Simon wants to play the game. He wants to reconnect with his estranged best friend Kat, who used to play games with him. But soon he finds out that Otherworld isn't what it seems and it's hiding deep, thorny secrets within the false reality. They are the actual ones getting played. I was on the edge of my seat from around the middle of the book when the action really heated up and became page-turning and fascinating. The entire Otherworld universe is immersive and brilliant, dark and had a highly addictive plot. Simon and Kat were poignant, fierce characters and I loved the dynamic between them and their individual personalities as a whole, even more. Overall, Otherworld is compulsive and swift, with a magnificent plot. Jason and Kirsten have created one of the best books I've read all year (and maybe longer). The amount of illustrious detail that has gone into the Otherworld world is absolutely fantastic. This can't get a higher rating from me - five stars completely. I can't think of anyone who I wouldn't recommend this to. You will be missing out if this isn't on your shelf this year! 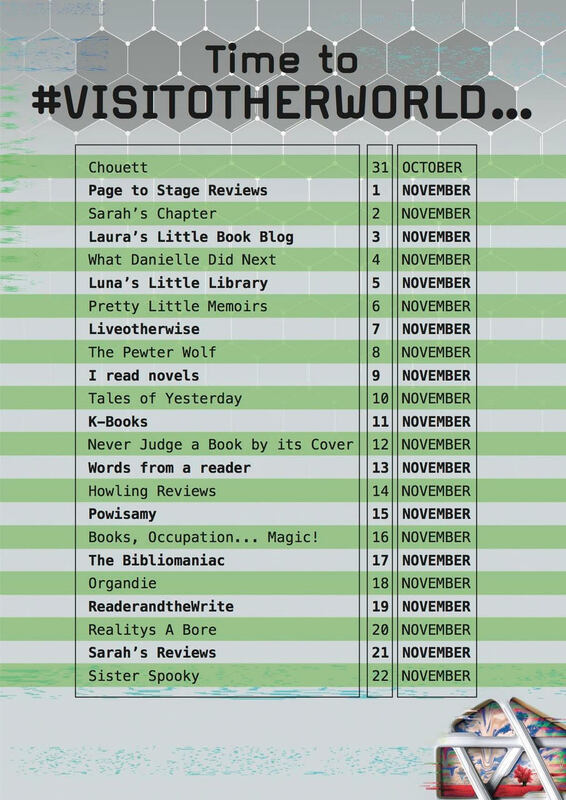 Rating & Recs For fans of Young Adult Science Fiction! 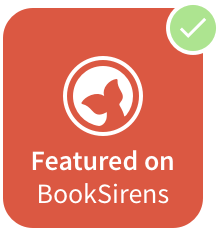 Perfect for younger readers and older. Be sure to check out the OTHERWORLD tour dates before and after my own to get in on the excitement! You can buy OTHERWORLD here and here. Keep up to date with all things Otherworld here!